MTMC2 : Nevermore Press is an all-inclusive full service Publisher Facebook Event, Fun, Prizes and so much more. Nevermore Press is an all-inclusive full service Publisher Facebook Event, Fun, Prizes and so much more. Nevermore Press is an all-inclusive full service Publisher that incorporates all things Public Relations and Professionalism. Our team is there for our authors. Everything is handled in house by authors for authors. Nevermore Press handles all genre’s and will only give our readers the best of every genre available. Nevermore Press started as a PR company, we love helping other authors and taking the stress out of the promotion headache of publishing. It was only natural to take our love of publishing, and promoting to the next level. This is when Nevermore Press was born. We have hit the ground running and are currently accepting submissions. 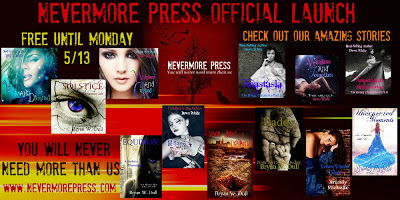 Visit www.Nevermorepress.com to meet our team and see what we have in store for our readers! We will have a facebook event with free books, prizes, games and other goodies. Please join us in celebrating the launch of an amazing Press with a great starting line up of authors!!!!!! !